Tresor Mputu Mabi has enriched his status as one of the most talented footballers around with the Best Player on the continent award at Glo-CAF Awards 2009 Gala. 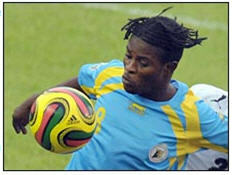 Mputu, nicknamed the “Treasure of Congolese football” came out tops in the category dedicated to footballers playing on the continent judging by his performances for his club, T. P. Mazembe in the Orange CAF Champions League and the DR Congo national team during the maiden edition of the African Nations Championship (CHAN) held in Cote d’Ivoire in March 2009. The crafty offensive midfielder played an influential role as Mazembe lifted the biggest prize in African club football for the first time in over four decades, beating Nigerian side Heartland FC on the away goal rule after a 2-2 tie from both legs. He also scored some crucial goals notably during the first leg of the final in Owerri, which proved pivotal in Mazembe’s claim for the ultimate. Prior to that, he led the Leopards to beat Ghana 2-0 in the final of the maiden edition of the CHAN, the newest competition on the African football calendar and designed for footballers playing in their domestic leagues. At 25, Mputu is seeking for fresh challenges after guiding Mazembe to almost everything there is on the domestic and international scene. The Kinshasa-born player piped Uche Agba of Heartland FC (Nigeria) and Abdelmalek Ziaya of Entente Setif (Algeria) to his first ever major individual honour.